This jovial three-hour dinner cruise is the ultimate holiday experience. 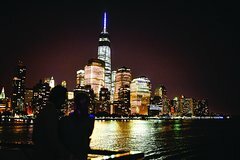 Ideal for group outings, this cruise offers mesmerizing nighttime views of the New York skyline, as well as a dinner buffet and DJ entertainment. Celebrate the season in style. Hornblower docks are located at Pier 40 in the west village. You’ll need to check in and then you’ll board our luxury yacht. Once boarded you’ll be shown to your seats and given your complimentary glass of sparkling wine. You’ll also be able to purchase drinks throughout the cruise. If you need anything or have any questions at any time, please be sure to let your waiter or one of our other friendly staff members know. You’ll start cruising at 6:30 pm to enjoy all the Hudson River, New York Harbor and East River have to offer. Shortly after the cruise begins, the buffet will be open for you to enjoy a delicious Festive inspired lunch buffet. The journey will start north on the Hudson for a great view of the Empire State building with New Jersey to the other side. You’ll then turn south toward the Statue of Liberty and Ellis Island and, of course the ever present Manhattan skyline with Freedom Tower. The cruise then heads along the East River past Governor’s Island, below Brooklyn Bridge and Manhattan Bridge along with views of Brooklyn’s waterfront. Watch it all pass by again on the way back while enjoying drinks, good company and dancing to the onboard DJ. The cruise ends back at Pier 40 at 10:00pm.